Asus is well known for its overclocking abilities so we're going to be a bit rough with the P5B Deluxe/WiFi-AP motherboard. Equipped with an Intel Core 2 Duo E6600 processor and 2GB of Corsair's quick Twin2X2048-6400C4 memory, we lowered the memory to run at DDR2-533 MHz mode so it will not hold the motherboard back. 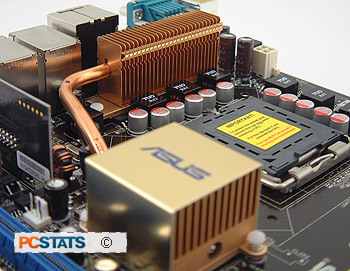 Starting at 266 MHz, the Asus P5B Deluxe/WiFi-AP motherboard clock speed was increased in 5 MHz steps. The P5B Deluxe/WiFi-AP easily passed 300 MHz, but at 320 MHz it ran into some problems. Increasing the Northbridge voltage to 1.55V solved these issues, and a few moments later it was necessary to bump the CPU voltage to 1.4V also. The Asus P5B Deluxe/WiFi-AP ran into further problems at 350 MHz FSB, this time around the Northbridge voltage had to be increased to 1.6V, the Southbridge to 1.7V. To reach the motherboard's top speed, the CPU voltage needed to be increased a bit more, to 1.6V this time. After that, the motherboard could run at a very impressive 420 MHz FSB! The Asus P5B Deluxe/WiFi-AP motherboard has all the usual memory timing adjustments you'd expect from a high end motherboard. From CAS Latency to RAS to CAS delay and RAS precharge, everything is here. The FSB can be tuned between 266-500 MHz in 1 MHz increments. 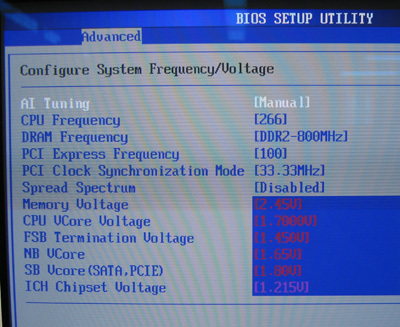 You have a whole host of DDR2 memory operating frequency options including unofficial DDR2-1066 support. The maximum memory voltage is 2.45V, CPU voltage 1.7V, Northbridge voltage 1.65V and Southbridge voltage goes to 1.8V. The details of how the Asus P5B Deluxe/WiFi-AP motherboard test system was configured for benchmarking, including the specific hardware, software drivers, operating system and benchmark versions are indicated below. 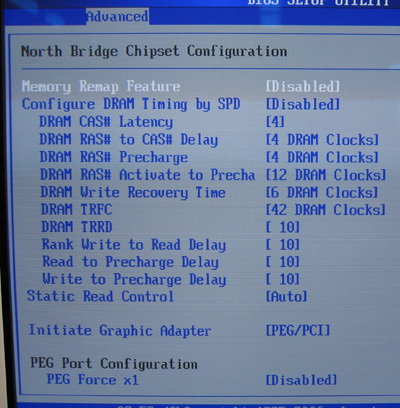 In the second column are the general specs for the reference platforms this Intel P965 Express based system is to be compared against. Please take a moment to look over PCSTATS test system configurations before moving on to the individual benchmark results.